(Top) Rufus is calmly positioned for capturing a heartbeat of 177 beats per minute at 8 weeks and 3 days. (Bottom) The seemingly irritated Reefus would barely stay still to measure a 183-beats-per-minute heart rate at 8 weeks and 3 days. According to the original plan laid out for us in the beginning of the in-vitro fertilization process, heartbeat detection was the stop before the reproductive endocrinologist released us to a normal obstetrician. But at that surreal visit of two strong heartbeats, the doctor said he wanted to see me again. I’d been cramping a little but frequently on both sides, and even though I’d read of such discomforts, I was afraid of miscarrying (isn’t everybody?). Apparently, the hyperstimulation of all the drugs left my ovaries slightly larger than life and the source of my pain. That meant one more visit. Seeming to grow very quickly, I was already wearing maternity pants when the next visit came around. Yet, I was nervous that the doctor would tell me he’d been wrong and I wasn’t really pregnant. But no, very quickly he found both babies with slightly larger heads with pounding heartbeats. One laid to the left, very calm and immediately detectable. That’s Rufus (though, I might have mixed up the names in a previous post. For future reference, Baby #1 is Rufus, and Baby #2 is Reefus). The nature of this kid was something like the Mr., relaxed and carefree. The second one, however, seemed not only a little shy but downright annoyed to be bothered so early in the morning. Reefus was head down and apparently wanted to stay that way. The kid turned away from the probe like you would to stay in bed when it’s time to get up — at least three times. The little arms waved up and down and the little shoulder shrugged like, “Leave me alone.” It was fascinating to watch. It looked like something I would do (read: will do tomorrow). Despite the drama, we saw then heard both heartbeats loud and strong. I have no words for that moment. It was just wild. 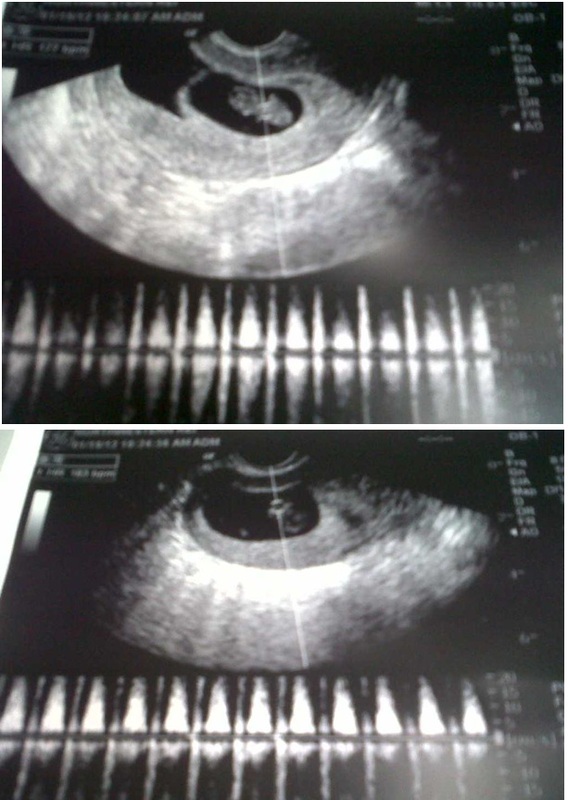 That was the last time we saw them, but we get to seem them again this week — this time by external ultrasound. I’m anxious to see what attitude Reefus will have to display. Only God knows.